Please Note: We are now open Monday - Friday, from 9am to 6pm, and Saturday, from 11am to 5pm. The Flag Shop is Ottawa's destination for embassies, travelers, businesses, public institutions, teachers and students. We have on hand the widest in-store selection of flags, pins, crests, flag equipment, decorative banners and traveling supplies. We celebrate diversity at The Flag Shop, and encourage people to show their roots. At The Flag Shop Ottawa, we also custom print and sew your flags and banners. 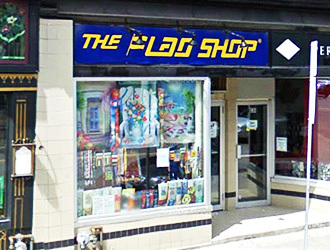 The Ottawa Flag Shop is the most central full-stock and full-service flag retailer and producer. We are in the heart of the Glebe, close to Lansdowne Park, and 3 kilometres from Parliament Hill. Come visit us or contact us for a quote for your flag and banner project!